Today is the first day of the fall semester and this year, the student population is already breaking records. 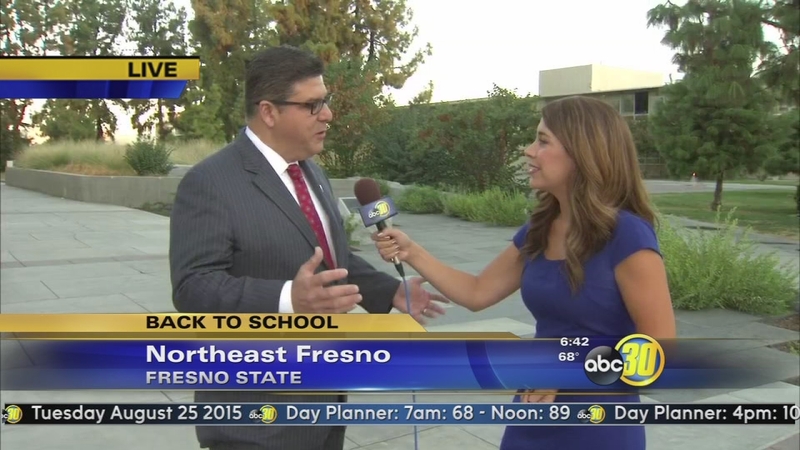 FRESNO STATE (KFSN) -- Tuesday is the first day of the fall semester and this year, the student population is already breaking records. A projected 23,882 students - the largest number in university history - will begin class in Fresno State's 105th year. Last year's official enrollment was 23,179. Over the weekend, nearly 1,000 students moved into the dorms. There was a lot of excitement on the campus as students met new friends, President Castro and even Victor E., the school mascot. On Monday, students attended the new student convocation at the Save Mart Center. A projected 23,882 students - the largest number in university history - will begin class in Fresno State's 105th year. When students head back to school, they will see several construction projects that are underway or finished. Crews have been working the new Jordan Agriculture Research Center. Another project that will impact students is the electrical infrastructure overhaul to the 1950s campus. The new physical therapy and intercollegiate athletics building is close to being completed. University officials say with several projects underway, they want to remind everyone to be caution around campus. Traffic and parking are often congested the first few days of instruction, so students and employees are reminded to arrive early.